Over the past couple of years gardening has come back into fashion with some areas having waiting lists for allotments. 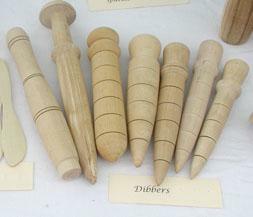 This range of dibbers has been designed to help with planting of all types of garden produce from potatoes to seeds. As with all of our hand turned products our range of dibbers is to a standard design but each is unique. Sizes may vary so come and see use at a show near you and find the one that’s right for you.